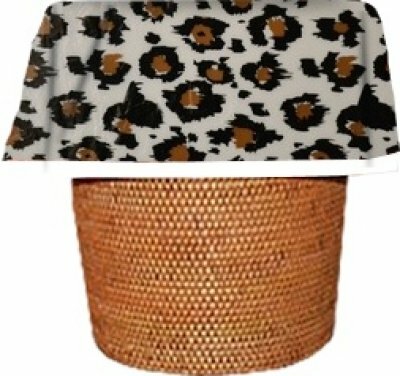 Designerliners Wholesale 50-Pack Black Leopard Biodegradable Home Decor Waste Basket Trash Bags - 7 Gallon Size - 24'' H X 21'' W by DESIGNERLINERS at Animal Backgrounds. Hurry! Limited time offer. Offer valid only while supplies last. Black leopard designerliners come in the 7 gallon, 21 by 24 inch size. Like all designerliners, the black leopard pattern is printed on the inside. Black leopard designerliners come in the 7 gallon, 21 by 24 inch size. Like all designerliners, the black leopard pattern is printed on the inside. To use, take the designerliner out of the package and insert it as is in the wastebasket or other trash container. Now, extend it over the sides of the container so that the pattern shows not only inside the container, but also on the outside. Designerliners are good for the environment; they are biodegradable and will beautify any room in the home. Each package contains 50 designerliners. There is no need to discard designerliners after each use; for economy, empty the contents of the bag several times before discarding. Bulk wholesale lot packed in clear plastic - not retail packaging. There is a Designerliners pattern to brighten every room in your home. Affordable home decor; empty and reuse each bag several times. Strong 1-mil thick; biodegradable and made in the USA. If you have any questions about this product by DESIGNERLINERS, contact us by completing and submitting the form below. If you are looking for a specif part number, please include it with your message.